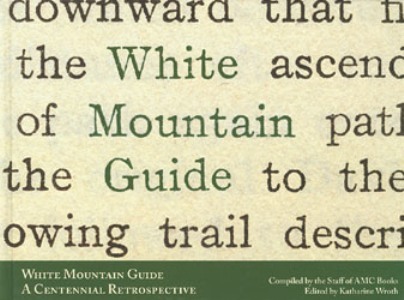 White Mountain Guide: A Centennial Retrospective, 2007. Large format, coffee table book chronicles the 100-year history of the AMC White Mountain Guide, long known as the "hiker's bible." Features many interesting essays on the guide and those who created it and used it through the years, as well as hundreds of historic images, many never before published. Includes a chapter for each of the 28 editions of the guide, along with a color fold-out showing the covers of all the editions. Another section traces the evolution of trail maps in the White Mountains. A must for White Mountain history buffs. Hardcover, 224 pp., 12" x 9."